The Newest Rant: "Princess Pups" Comics are a Stellar Read! Puppies + Royalty = Some Great Reading! I've mentioned comic-creators Lindsay Hornsby and her husband James Hornsby before on the blog, having met them before at one of the Project Comic-Cons and most recently running into them at the 2nd Annual Mini-Con held by the City of Saint Louis Library System. At the mini-con I picked-up two mini-comics (no pun-intended) under Mrs. Hornsby's, "Princess Pups," line and greatly enjoyed them! I read both the 1st issue of, "Princess Pups Minis," which contains various short strips about the puppies and a longer-form story, "Princess Pups In Spaaace!" I greatly enjoyed reading both all-ages comics and found they each had their own unique charms! Shall we review them? Yes, we shall! "Princess Pups Minis #1" and "Princess Pups In Spaaace!" This mini-comic about the Princess Pups features shorter stories that range from anywhere between longer 5-ish pagers to 1-page joke-strips. 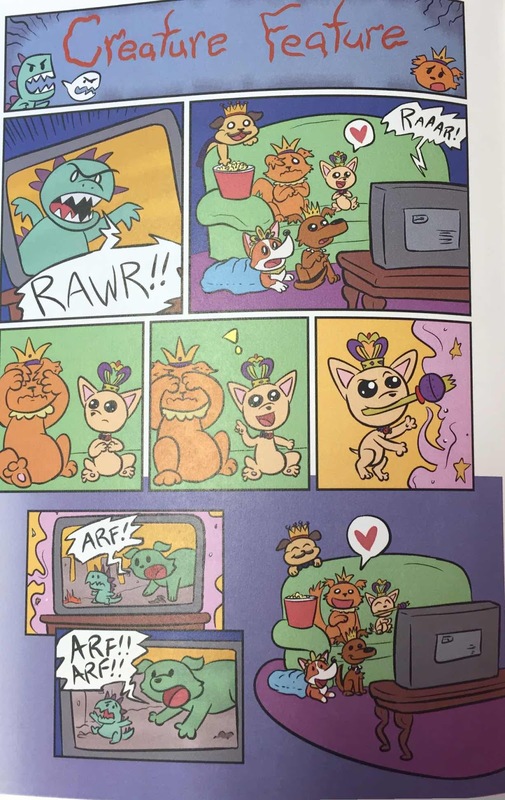 Many of the strips feature the pups eating delicious snacks or putting-up with the shenanigans of cats who live nearby and often will try to either steal the pups' food or otherwise cause difficulties for the young dogs. Thankfully, the Chihuahua pup has a magical scepter of sorts that often resolves any difficulties caused by the cats or other annoyances. In one of my favorite stories that is a short 1-page piece, all of the puppies are watching a horror movie but one is quite unnerved by it. Thankfully, the Chihuahua pup uses her scepter to morph the movie into a less distressing feature and resolves the fear. If only I could change the outcome of many lame movies! I liked this strip a lot because I could relate to how often I'll be watching a movie and thinking to myself, "It would be so much better if *this* happened..." and to think a magical scepter could fix some of the idiotic choices characters make in horror movies, or could correct the horrendous twist ending of, "Now You See Me," would be a power I'd be eager to weld. Also, Mrs. Hornsby's artwork is stellar, bright and energetic, giving the comic a perfect happy and cute vibe; often your more independent/small-press comics will have great storytelling but mediocre-to-poor artwork, but Mrs. Hornsby absolutely slays it with her adorable illustrations. Were I to have a complaint about this issue of the, "Princess Pups," it would be that some of the stories feel like they could be even better if they went longer and were allowed to, "Breathe," so-to-speak. Some of the 1-page gags feel like they could be even more hilarious if extended, but I understand that as this is a, "Mini," collection and that the stories need to be shorter. That said, my desire for a longer-form story with the puppies was met in the also great book, "Princess Pups in Spaaace!" Within the mini-comic, "Princess Pups in Spaaace!" we get a stellar story where the Princesses are invited to join the Space-Pups on another planet for a party. An exact reason for the party is never given, but do you really need an excuse to have a fun party? Answer: No; you do not ever need an excuse. The Princess Pups prepare a rocket ship and join the Space Pups at a swanky base on the other planet where cookies and cakes are enjoyed. Mrs. Hornsby's aforementioned adorable artwork makes everything look quite fun as well! However, then something interesting happens that really sold me on this comic--stuff gets ugly. I earlier described how Mrs. Hornsby expertly illustrates the cute puppies and their adventures, but in this comic she shows off how her art-skills are not just limited to adorable pictures, impressing me even further. You see, there are some space-bugs at the station who help with the up-keep, but as many signs declare, they are not to be fed the pastries. One of the Princess Pups in an effort to be nice ignores this rule and gives the small little space-bug a cookie. At this point the artwork goes from cutesy to something that made me think of the scene in, "Akira," where the teenager turns into a hideous blob monster. The space-bug grows to immense size and looks just absolutely disgusting--and a bit terrifying too! 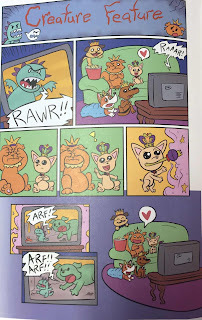 The comic of course is geared towards all-ages so there isn't blood and guts or anything, but it is just an awesome surprise for Mrs. Hornsby to take the artwork in a direction a bit less, "Saturday-Morning Cartoon," and more-so something reminiscent of John Carpenter's, "The Thing." The space-bug transformation is quite scary. Thankfully the Space Pups are prepared for this sort of emergency and feed the space-bug an antidote before too much mayhem can be wreaked. Still, it is a fascinating twist in the story when the nightmarish transformation happens and made this comic even more enjoyable with its sudden swerve in art-style. Considering how almost all of each comic is without dialogue (the Puppies never speak in anything but growls and barks) other than the written invitation from the Space Pups in the space-themed piece, the comic relies heavily on the artwork to get across the story, and as my compliments about Mrs. Hornsby's artistry illustrates, it fulfills the task of telling us an entertaining yarn without any problem! 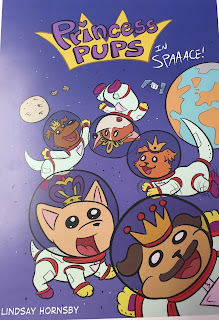 I loved both comics, but enjoyed, "Princess Pups in Spaaace!" just a smidgen more thanks to the story feeling like it had more time to develop as a full-length tale, and also due to the fascinating monstrous-mutation of the space-bug in the book. 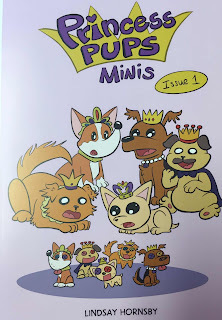 Princess Pups Minis #1--4.5 out of 5 stars. Princess Pups in Spaace!--5 out of 5 stars. As someone who enjoys good comics, great artwork, and fun storytelling I can say without a doubt that the, "Princess Pups," comics by Lindsay Hornsby are a great read for all ages and genders! It always makes me happy to find awesome local comic-makers here in Saint Louis and I would recommend for sure you check out Mrs. Hornsby's work, much of which she links to via her Twitter account here. The adventures of these Princess Pups make for stellar entertainment and I'll bet if you pick them up you'll enjoy them too!